Closet Fashion Content Analysis: Do Not Bleach! Grey & white striped Armor Lux top. Photo by JoyD. So what part of "do not bleach" did I not understand? 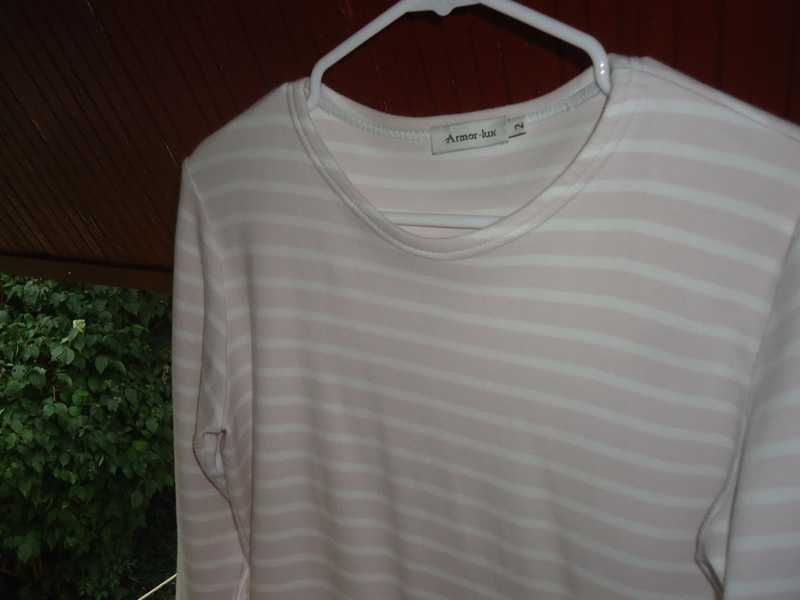 I noticed a black smudge on my Amor-Lux grey and white striped long-sleeved top. I decided that I would use one of those bleach pens to just dab it lightly and if the grey bleached out white a bit, I could live with that. Trouble is the bleach turned the grey to a pinky beige colour. So then there was a pinky beige splotch on the grey and white stripes - actually worse that the black smudge that was there in the first place. So what did I do? Bleached the whole thing of course. 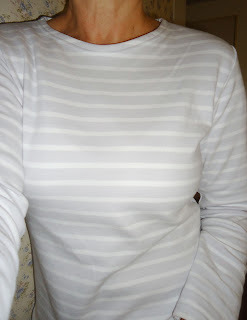 Now instead of grey stripes, I have pinky beige stripes. I can live with that but I am annoyed with myself for not heeding the manufacturer's washing instructions. Funny thing is, and it must be my personality type, I began looking for an explanation online after I created the problem instead of looking for a solution for the black smudge in the first place. I do like understanding why something happened. So now after the fact I found out from Yahoo Answers that the fabric, when you use bleach, "won't turn white. It will only bring it back to the original fabric colour before . . . dyed grey in the factory". Is that a fact? I read about a guy who put bleach into his wash of grey sweats and they all came out pink. Now I know and so does he. Bleach takes out stains from certain fabrics, it should not be used as a dye (for a lighter colour). If you are trying to get "white" by bleaching dark clothing, it probably won't happen. They will lighten but never become truly white. And of course, there's the other explanation of bleaching bringing fabric back to the original colour in the factory. Always dilute bleach. Straight bleach can damage clothing. Wear gloves in a well ventilated area when working with bleach. As far as clothing goes, linen and cotton stand up best to bleaching. However, rayon and some polyesters also can stand up to bleach. To work effectively, bleach needs to be mixed with warm or hot water. Never mix vinegar with bleach - the two create a toxic gas. Just click if you need the scientific explanation. Wool and silk are far too delicate to bleach. It may in fact weaken the fibers to the point of disintegration. There are plenty of sites giving good advice when working with bleach. I'm old enough to have known better. Sigh. Good info to know about bleach. I'm sorry you found out the unfortunate way about the results it can cause on clothing. I've only ever used bleach doing laundry when I wash towels and occasionally for cleaning around the house. I've heard some people using it to wash produce bought from the store. Diluted of course. That is too harsh for me. As for the top. The grey and white top was awesome but the pinky white top is cute too. Grey - beige - there are worse things that could have happened. Apparently there are many safe uses for chlorine. One of which is to add to cut flower arrangements, which make the flowers last longer. Although, I do think the grey sweats becoming pink is quite hilarious. Biker Chic . . . Again . . .